Don't guess. Give modern clothing sizes in the space provided. Usual shipping time on custom orders is 6-8 weeks. Common sizes and items off the rack can be shipped immediately. Please also note that larger or odd sizes could cost extra. PLEASE NOTE- As stated above, Quartermaster Shop uniforms can take 6 - 8 weeks for delivery. If you are new to reenacting, or not a reenactor, this may be difficult to understand. All of our uniforms are hand made in the US. 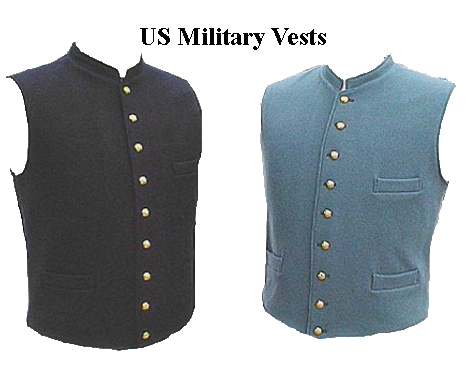 The Uniforms are made in a production environment by experienced tailors. As each order is recieved, it is put onto a schedule for production on a first come first served basis. The item is shipped as soon as it is completed. I am sorry to have to be so explicite, however, once in a while we encounter a frustated customer that believes that "made to order" items should ship within a day or so. US Officer Letter buttons are available, specify letter desired (A, C, or I), add $13.50. US Staff Officer buttons are available, please add $17.55. In both the Sky Blue Wool and Dark Blue Wool we have available a deluxe grade of wool - for officers, additional cost.. ( A little lighter weight and finer finish).